The Prime Minister, Peter O’Neill has thanked International Observers for their role in ensuring transparency in the 2017 Papua New Guinea National elections. The Prime Minister made the observation following comments by the Commonwealth Observer Group that noted that while there had been challenges, that the election results should reflect the wishes of the people who participated in the 2017 national elections. 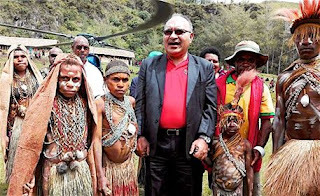 “There will always be critics, there will always be people with vested interests, but in June and July 2017 our people have had their views heard,” the Prime Minister said. "Democracy is a right of our people, and over the past few months we have all exercised that right as candidates have campaigned, people have listened to views from all sides, and then the voters cast their ballots. "The process was not perfect, but you tell me a country where the process is perfect. You can look to elections in industrialised countries like the United States or Australia, to other countries around Asia, and there is no such thing as a perfect election, but we work hard to ensure the process is transparent and fair. "Our electoral commission has done the best it can, with the best people it could employ, and it is delivering a free and fair electoral process. "While individuals with an agendas will try to talk the elections down, there is universal agreement that these elections have been the most peaceful elections in recent decades. “The last three elections in particular, from 2002 to 2012, involved widespread violence and the hijacking of democracy, but those days have passed. “Around the country we saw a peaceful election process, where from the islands to the highlands, people went about their business and placed their votes.